Iranian Kurdish journalist Behrouz Boochani has been named the 2018 recipient of a journalism award for investigative reporting. Boochani fled Iran in 2013 and made his way to Australia’s Christmas Island. From there, he was transferred to Manus Island, in Papua New Guinea under Australia’s controversial refugee policy that prevents asylum seekers from arriving in the country by boat. He has lived on Manus Island since 2013, documenting the poor conditions of the hundreds of people detained there. The centre was ruled illegal in 2016 and shut down in 2017, but hundreds remain caught up in legal complications. 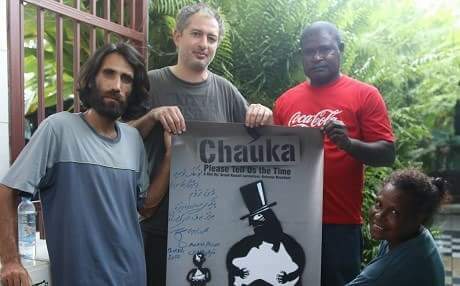 “I believe this international recognition proves what the Australian government has done on Manus and Nauru is a global issue,” Boochani told Guardian Australia on Friday about winning the Anna Politkovskaya award. “This award is to shame the politicians who take pride in torturing innocent people. Events and awards as such create new spaces for us to have a dialogue about this important issue. And as always, makes me more determined to continue with my activism and write,” he said. Boochani’s book No Friend but the Mountains was published this year – it was written largely by text message. Using a mobile phone, he secretly filmed a documentary, Chauka, Please Tell Us The Time, released in 2017. He has also written diaries of life in the offshore detention centre for Guardian Australia. Boochani co-founded a Kurdish magazine in Iran, Werya, that reported on Kurdish cultural and political aspirations. In 2013, Revolutionary Guards raided the magazine’s office and arrested several staff. Boochani went into hiding and then fled the country. Russian journalist Anna Politkovskaya was shot dead in her Moscow apartment building on October 7, 2006. The Anna Politkovskaya journalism award is handed out by the Italian magazine Internazionale.